Most people want their workouts to be two things: fast and effective. That’s where high-intensity interval training techniques, like Tabata, come in handy. 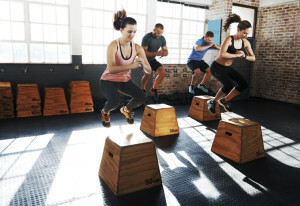 Developed by Dr. Izumi Tabata for Olympic speed skaters, Tabata is a form of high-intensity interval training (HIIT) that’s been adopted by boot camp devotees, CrossFitters, and plenty of fitness fans who just want to spend less time in the gym. The 20-10 pattern has been shown to tax both aerobic and anaerobic pathways more than intense exercise with longer rest periods, meaning improved overall cardiovascular fitness. By taking rest periods only half the length of the intense bursts (a 2:1 work-to-rest ratio), the body is forced to perform without a full recovery. Translation: At some point between rounds six and eight, you’ll hit a point of maximum oxygen intake and be really (really) out of breath. Like many forms of HIIT, Tabata is an effective way to improve both metabolic pathways, initiate the afterburn effect, and can even stimulate growth of the mitochondria that powers muscles. It can mix up an otherwise dull running routine and even suits road warriors looking for a quick and effective hotel workout. But Tabata isn’t for the faint of heart (literally or figuratively). The routine was developed to fully exhaust Olympic athletes, so it’s probably not the best routine to try if you’re a total newbie. It requires a pain threshold for maximum level effort for multiple cycles—anyone with preexisting cardiovascular conditions should consult with a doctor first.